The S3ADSIQ80M12BT22ULL is an ultra low-power, ultra-compact 12-bit Dual-Core High-Speed SAR ADC IP. 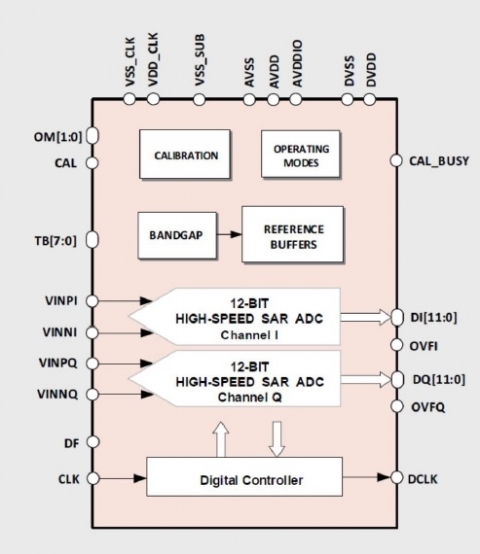 This IP includes 2 ADC Channels sampling up-to 80MS/s. It features an excellent dynamic performance including -75.0dB THD and 10.2-bit ENOB. It also features an excellent cross-channel performance with < 0.2dB Gain Mismatch and -75.0dB Crosstalk. This high-end performance is obtained with an ultra compact die area of 0.043mm2 and dissipating a mere 6mW for the complete IP (both channels sampling at 64MS/s). The S3ADSIQ80M12BT22ULL does not require any special analog options, and can be cost-effectively ported across foundries and process nodes upon request.